Twenty years on, virtual experiment Gorillaz remains worthy of attention with sixth studio album, ‘The Now Now’. “Forget concept albums; this is a concept band,” is what was proclaimed when the Gorillaz first emerged with their self-titled debut in 2001, three years after a couple of Brits first decided to try their luck at launching an animated rock band. At first, that concept proved to be a fruitful one, as “Clint Eastwood,” “Feel Good Inc.” and “Dare” became some of the most innovative and defining singles of the early Aughts. Yet the group’s flare seemed to die down with the passing years, as they released very little music in the time following 2010’s dual release of Plastic Beach and The Fall. Looking to offset that dry spell is The Now Now, the second half of yet another duology released in tandem with last year’s Humanz. However much listeners enjoy this latest release may well come down to how accepting they are of the idea of a “minimalist Gorillaz album.” For years, this virtual band was well-known for hurling a limitless variety of musical themes at their listeners — the upbeat funk on “19-2000,” the giddy fusion of electronica, hip-hop and rock on “Clint Eastwood,” the psych-pop and new wave that surfaced on many of their latter-day records, and so on. They also recruited a surprising number of old-school hip-hop artists to the studio, many of whom (De La Soul, Bootie Brown, Del The Funky HomoSapien) scored their biggest hits in over a decade with this wacky animated quartet at their sides. By co-creator Damon Albarn’s own admission, this is a more restricted affair: “it’s pretty much just me singing,” he says of The Now Now. “Singing very expressively,” mind you, but in terms of shifting around genres and collaborating with tons of unexpected guest artists, the new Gorillaz record is a degree less musically adventurous than some of the band’s past efforts. The Gorillaz’s next-most musically adventurous records are still perfectly satisfying by almost any other standard, however, and longtime fans will certainly find plenty to enjoy here. It’s hard to imagine a more inviting opening track than “Humility,” with its light, breezy nature and ode to taking time off to get in better touch with your inner self. The music video contributes to the song’s super pleasantness — who could say no to watching blue-haired band member 2-D roller skating through sunny Venice Beach, with a grinning Jack Black strumming his guitar at every few stops? 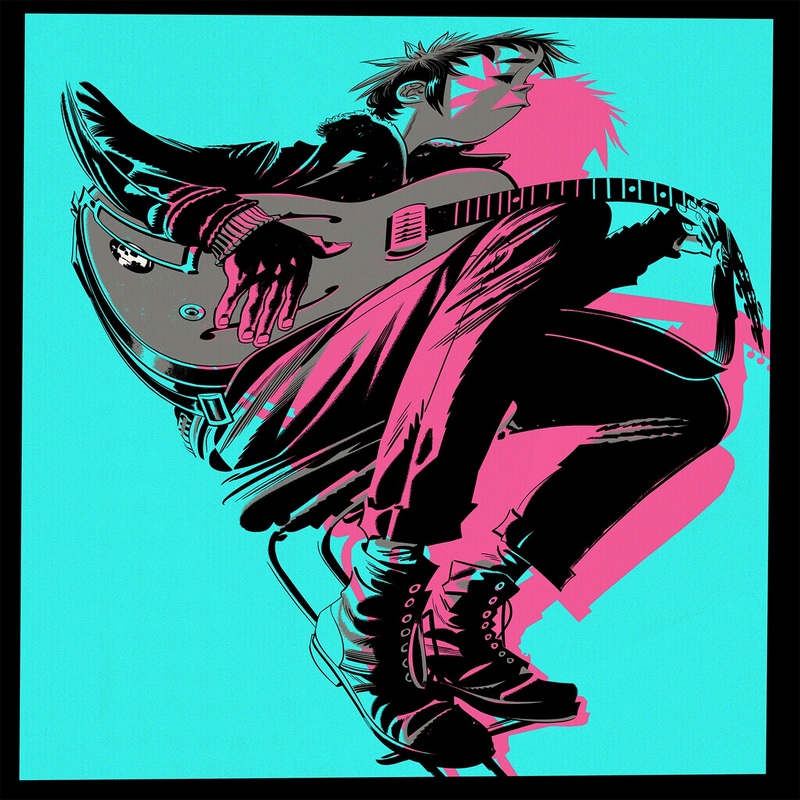 As with other Gorillaz records, The Now Now shifts between louder and quieter songs, while also making room for some funky instrumentals. Generally speaking, this formula works pretty well. Be it “Idaho,” “Hollywood,” or “Lake Zurich” (arguably the album’s greatest standout), the music has the ability to wash over listeners and fill their minds with thoughts of the grandeur of the various locations which the songs are named for. While the album is far less cluttered with guest artists than the Gorillaz’s music tends to be — although the few that do appear here, like rapper Snoop Dogg and guitarist George Benson, all impress — that cleanliness contributes to the simple, straightforward nature of the record in its own way. Things do get on the slow side occasionally, like with the plodding “One Percent.” But at a brisk 40 minutes, there’s nothing much here to test fans’ patience, and a great deal more that will keep them happy and energized, particularly (as is likely true of the bulk of them) if they’ve been listening to the Gorillaz for the better part of 15 years, if not longer. Without quite returning to the heights of Demon Days, the record that marked the group’s peak in 2005, The Now Now proves that Damon Albarn still possesses the remarkable ability of spending a single month in the studio (which is reportedly all it took for this record to be made) and emerging with lively, engaging material that keeps his virtual brainchildren going strong as their third decade of digital existence dawns.